Here is our next interview with another girl from our Hyundai scene, Simone will tell us why she is so in love with her Veloster and why girls are more and more starting to tune their cars. Hi, i am Simone from Lake Constance in the south of germany. My first car, even when it was not my car, was the Hyundai Lantra sportswagon from my parents. When i recieved my driving license, i was still in training for my job and did not have enough money for my own car. That was the reason i used my parents car. We had the Lantra several years and it was a very reliable car which made no problems at all. After my first own car (Opel Corsa B) i bought my first “long-held wish car” a Peugeot 206cc convertible. After a fullcrash with it (not my fault), i came to the Veloster… The Veloster is the car of my dreams and i never had any stronger emotion for a car lik this! The first car i modified first was the Veloster. Since you only have a few modifications in germany available, i started to import them or modified the parts by myself. This challenge, of tuning the veloster in germany, keeps me happy and i love it to give the veloster his own personality (step by step). 4. How did Hyundai grabbed your attention? 5. When was the first time you heard or seen the Korean Automaker? My first contact with Hyundai was, when my parents got their Lantra around 20 years ago. Beside the Lantra the dealer even got a Coupe J2 at his showroom, which instantly recieved my attention. I was totaly stunned by the sporty design and since this “meeting” it was a big wish from me to get a car like the J2. This dream is now reality (kind of) with my Hyundai Veloster. 6. Tell us your current modifications on your Veloster. Interior: Interior with white leather, some carbon parts. Exterior: Racinggrill, Import foglight cover, black Windowtint, Sequence rearspoiler, aftermarket emblem and several carbon-foil parts. Engine: Special-unique stainless steel catback with remote valve switch racing-cat. Rims: 19” Tomason TN11 two-tone, Tegiwa Lug Nuts in black and the OEM-Brakes in white. Lights: Headlights with Xenon-HID in two-tone, Import eyelids and Realights tinted in black. Enginebay: Enginebay painted in white with several carbon parts and a Wiechers strutbar. 7. What is the modification you like the most? I dont have a modification i like the most. Its the whole car i love! The only part which is a bit more special then the other, ist the racingcatback with the remote valve, since its a unique modification. Oh, and i love my Sequence reaspoiler, because it was the first in germany. 8. 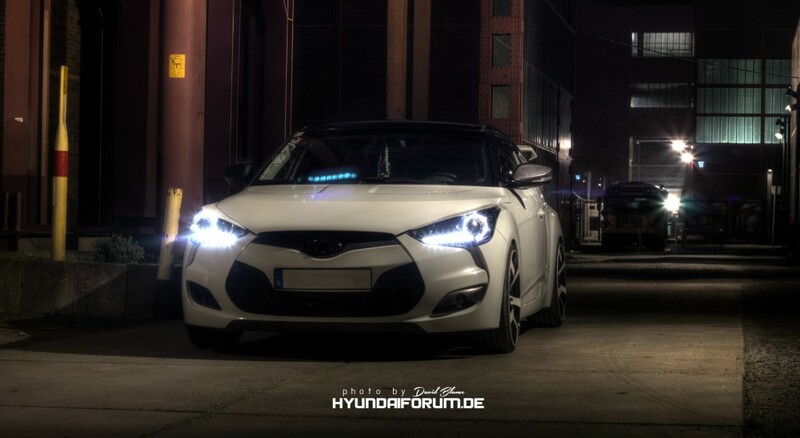 Since you have now modded your hyundai, what potential you see in it now? The Veloster is a unique vehicle by itself. Especially the optical 3-Door Design have never been before. Many people ask me something about it when they see the car. This have been increased since i started to mod the car. After i removed the OEM emblems, more and more people ask me, what kind of car manufacturer this is, my anwser, “It is a Hyundai” always lead to suprised people. I love my Veloster, because i found my partner (we are now many years in a partnership) with it. 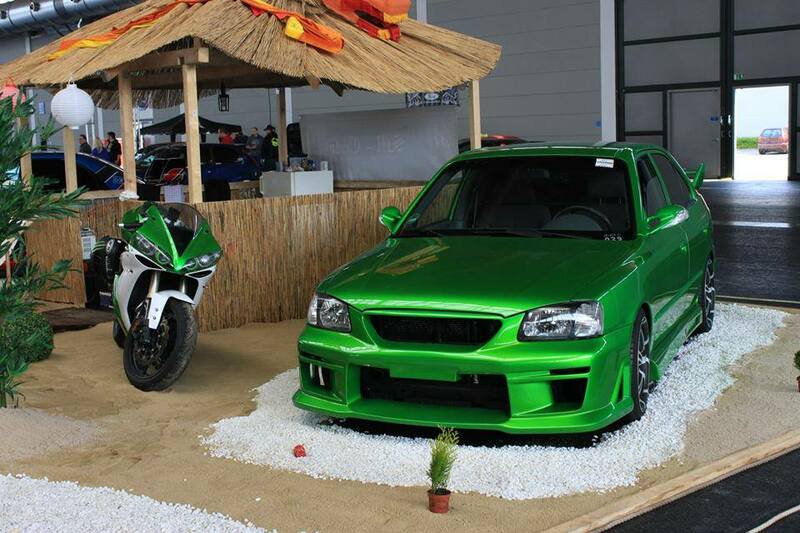 We met on Europes biggest tuningshowdown (Tuning World Bodensee). I was presenting my Veloster on it and he was there with his unique Accent LC (see attached picture). 10. Can you tell us into what trouble or advantage you went through for been a girl in the car scene? I often notice, that man dont take women seriously in the “scene”. When i am at events with my Veloster, most people are suprised its owned by a woman and not by man. My Boyfriend and me often get asked about it how “he” modified the car. When he tells them that apperantly “I” am the owner and tuner of the car, their jaw drop. This reaction approves me everytime that woman can tune the same way like man and are good for a suprise. 11. How difficult is to modify your car in Germany? It is very difficult. First, beacuse its hard to get mods for Hyundai in germany. And second because every modification need to be approved by the “TÜV”. The TÜV is checking the parts for security and if they are approved in germany. Since Import parts are nearly never approved, it is very hard to get them “legal”. They need to get checked by the TÜV and it is a very expensive part of the tuning. If you have parts, without the approval of the tüv, on your car, you are risking you driving license. 12. Are you part of a club? I am founder and admin of the “Korean Cruiser Bodensee”, a local but growing Hyundai and Kia group for activitys like tuningevents, and meetings. 13. Do you usually work on your Veloster by yourself? There are several jobs at the car i do by myself, like detaching parts or some foil an paintjobs. But i have the most fun with it, when i am working with my friends and boyfriend on it. 14. What are the future plans for your Veloster? My primary plan is, to drive my Veloster for many years. More modification are always some kind of spontaneous decisions. So i can not tell you what modifications will happen in the future. Living your dream has nothing to do with your gender. The most important part is to do everything what let you feel good and happy! 16. We are dedicating this space for you, for example thanking everyone you like or giving some inspiring words. I would like to thank my Boyfriend Dennis for his help with the modifications at my Veloster. I would like to thank Hyundai Motor Company for such a great car which keeps me happy every day. 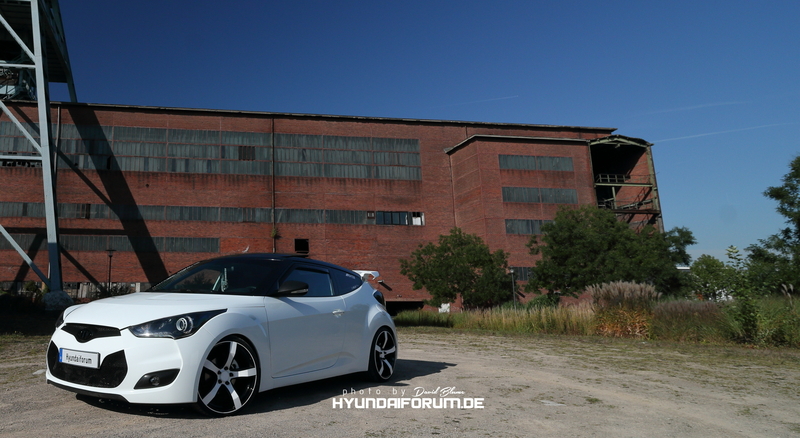 I would like to thank Andreas Winnenberg and Martin Hornung for the Hyundaiforum.de, a forum where everyone is allowed to give help, get helped or share ideas and projects with the german Hyundai community! And at last i would like to thank the whole “Hyundai Clubszene Deutschland” (Hyundai clubscene germany), for all the beatiful moments, events and friendships! Hyundai Fan and driver since the Coupe GK. Now i am driving a Genesis and still in love with the company. 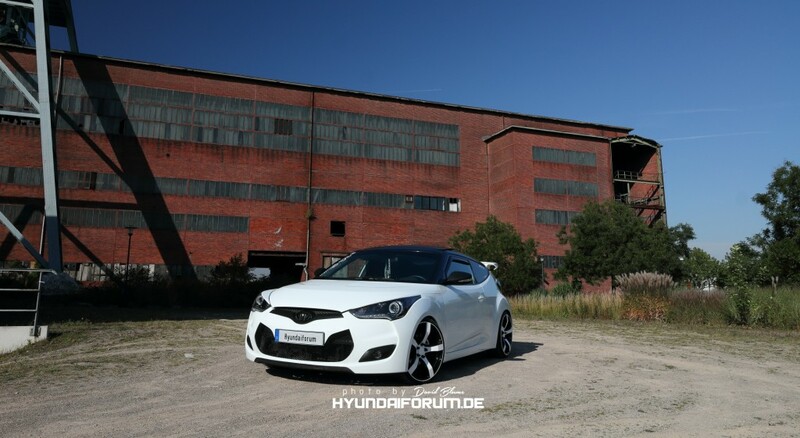 I am admin of the german hyundaiforum and love to meet all the nice people we have in the Hyundai/Kia scene!